While the share of U.S. adults who are married has been falling steadily over the past 40 years, married people continue to earn most of the nation’s income and pay the vast majority of income taxes, according to a Pew Research Center analysis of IRS tax administration data. 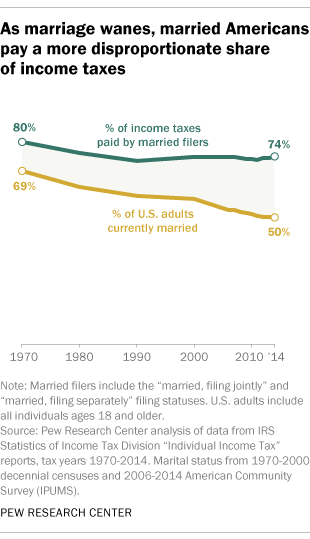 In 1970, 69% of adults were married, and they paid 80% of all federal income taxes. As of 2014, the share of married adults had dropped to half of the adult population (50%) but the share of income taxes paid by them fell much less, to 74%. The same period saw a sharper decline in the share of all tax returns filed as married (either “married, filing jointly” or “married, filing separately”). In 1970, married returns accounted for 60% of all returns, but fell to just 38% in 2014 – the most recent year that complete tax data are available. The fact that married Americans continue to pay roughly three-quarters of the nation’s income taxes, in spite of their dwindling share of the adult population, is in part a result of the changing demographics and economics of marriage. Marriage is increasingly linked with higher levels of education, which are in turn linked to higher incomes. 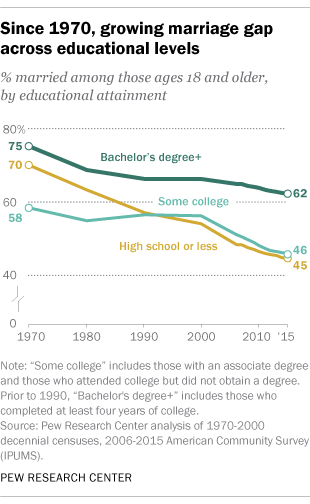 This marriage and education gap has widened as the share of high school graduates who are married has fallen more sharply than the share of college graduates who are married. In 2015, 45% of adults ages 18 and older with a high school degree but no college experience were married. This compares with 62% among those with a bachelor’s degree or higher. In 2014, the average return filed by a married couple or individual reflected an adjusted gross income (AGI) that was more than three times that of the average unmarried return ($115,100 compared with $35,200) – a gap that can be partially explained by the fact that many married returns are filed by two-income households. Not everyone who files a tax return has to pay taxes; income and eligibility for deductions largely determine who pays taxes and how much they pay. Married filers are more likely than unmarried filers to pay federal taxes. In 2014, 76% of married filers owed some tax, and among those who paid taxes, the average tax rate was 16% of AGI. By contrast, 58% of unmarried filers paid at least some income tax in 2014, at an average rate of 13% of AGI.